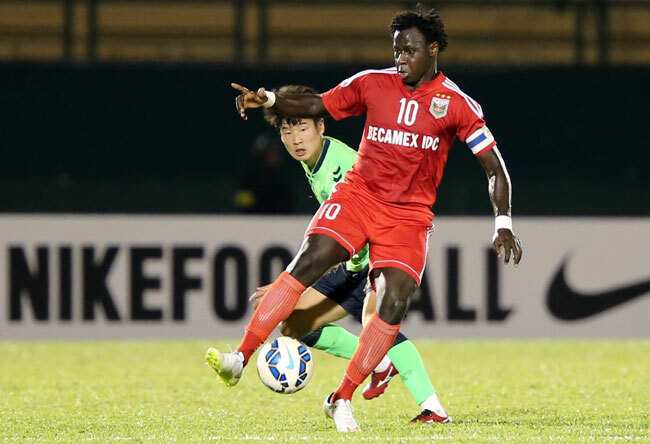 HA NOI (VNS) — Dieng Cheikh Abass scored during additional time yesterday to help Becamex Binh Duong pocket their first point at the Asian Football Confederation (AFC) Champions League. The Vietnamese champions, starting with players who rarely get first-team berths, tied 1-1 against Jeonbuk Hyundai Motors from South Korea in their second leg match of Group E at Binh Duong Stadium. As the hosts they had strong determination to win, they stated in the pre-match conference. Binh Duong quickly managed the central area in the first half. However, their attacks did not have much effect on Jeonbuk, who showed their strength in free kicks. Jeonbuk opened the score at the 30th minute with a corner kick by Brazilian striker Eninho Oliveira Junior, whose kick soared directly into the net. Goalkeeper Nguyen Quoc Thien Esele touched the ball but failed to stop it. A couple minutes later they nearly made the score 2-0, but Moon Sangyun's shot went wide. Captain Nguyen Anh Duc of Binh Duong had his chance after the interval but his attempt in the penalty area hit the crossbar. Golden-ball award candidate Le Cong Vinh was put on the field to strengthen Binh Duong's front line. The national team member, who just recovered from a surgery, did not make his mark during his time on the field. Meanwhile, Jeonbuk wasted two chances when Kim Dongchan and Eduardo hit the post and the crossbar consecutively. Abass made it a special moment in the last second of additional time. His long-distance kick went through the Jeonbuk defence, which covered goalie Hong Jung-nam's eyes and allowed the ball to reach the net. Abass was voted best player of the match. The draw did not improve Binh Duong's ranking, as they are still at the bottom position. Jeonbuk maintained the top spot with eight points. In the post-match conference, Choi Kang-hee of Jeonbuk said he wanted his team to earn three points from this match to strengthen their first place ranking. The target was not completed. Choi attributed the loss to the hot weather in Binh Duong Province. His team scored first, but players did not want to attack. They just tried to prevent the result. His counterpart Nguyen Thanh Son, however, praised his team's efforts against a much stronger rival who had been playing in the Champions League for years. In another match of the group, Shandong Luneng of China drew Japanese Kashiwa Reysol 4-4. Kashiwa Reysol stood second, with the same points with the leaders but less goal difference. Shandong Luneng stand at third with four points.